Oh yeah baby. Bacon Cinnamon Rolls. They are the perfect sweet and savory combination. 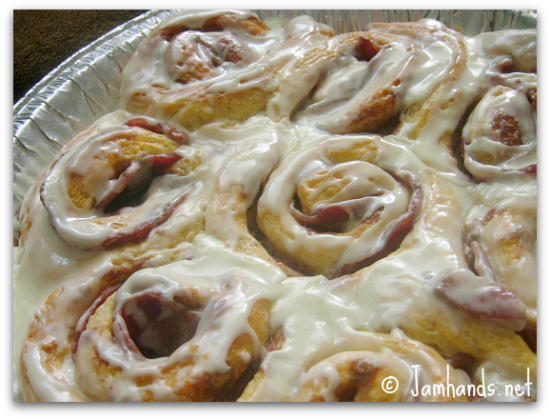 If you want to fancy it up, you can of course make the cinnamon rolls from scratch, but I really like the Pillsbury Cinnabon style of canned cinnamon rolls, so I use those. You can use a good quality precooked bacon, or regular bacon. I like the precooked bacon from Costco personally. 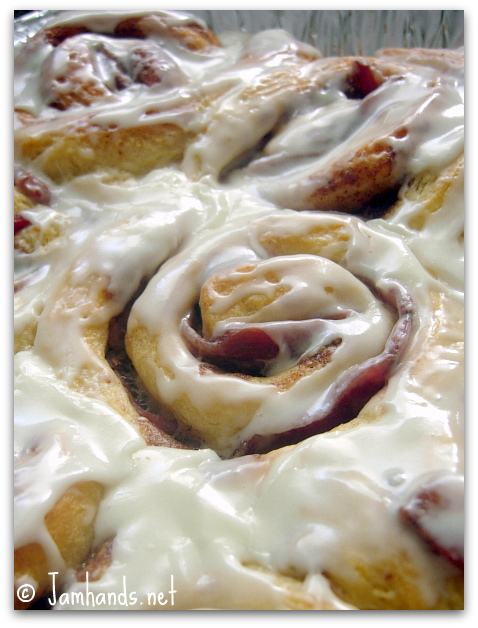 Either way, you have to crisp up the bacon a bit before you add it to the cinnamon rolls. Use the microwave or cook them up in a pan. One reason I like the precooked bacon is I can nuke it for a minute and I'm ready to roll. I never cared much for standing over a skillet getting splattered by bacon grease. If your bacon is extra extra fatty be sure to trim it off. In my experience when you add bacon to a roll like this, it takes a few extra minutes for the middle roll to cook though. Ovens vary, so make sure you take it out and test it to see if it needs extra time to bake. To test it, just pull out the pan, poke the middle roll gently with a spoon or random utensil, and if it is still doughy, it needs to bake longer. Two notes: When I rolled up the cinnamon rolls and the bacon together, I made sure to put the meaty side of the bacon facing up in the pan. That way you see the nice red bacon color. Second, I have only used a round 9" pie plate as my baking dish. If you would like, you can bake them on a baking sheet, but I can't vouch for how well they will stay rolled up. Baking in a round dish will take a bit longer than baking on a baking sheet. You will have to look and see for yourself if the dough is cooked through, so don't go too far from the oven. 1. Preheat oven according to package instructions. 2. Prepare the bacon. If using precooked bacon, microwave it for about a minute. If using regular bacon, either cook it until it is mostly done in a skillet or microwave it. You don't want it burnt to a crisp, but you don't want it raw either. Find a good halfway point. Set aside. 3. Prepare a round 9" baking dish with non stick spray. Remove the cinnamon rolls from the can. One at a time, unroll the dough gently. Add one piece of bacon on top of the dough strip, and roll it back up. Add to the baking dish. 4. Bake for 20 minutes, checking the rolls at about 18 minutes. See the notes above, you may have to cook for longer to cook through completely, ovens vary. When done, remove and frost with icing. I have made these before and they're yummy. I used to use an electric skillet (with grease drain) for cooking my bacon, but since I started cooking it in the oven about five years ago, there's just no going back. I line the baking sheet with aluminum foil for quick clean-up when I am done. You can't get much easier than that. What a combination! Wow, I've never even heard of bacon cinnamon rolls! Very delish! I'm bookmarking this for the next company I have! Thanks for linking up at Unwasted Homemaking. thanks for wishing me luck! i would still love for you to join. i am trying to make it more of anything really.. not just crafts. recipes/ photos, anything people want to share. I posted it early today because i was so nervous of it not working tomorrow...but after today the party will be posted on tuesdays!!! OMGosh. Totally going to try this. I believe you! No way!!! Now that is breakfast. Wow! My boys would be hoovering these. Thanks for sharing. Wow! How creative! 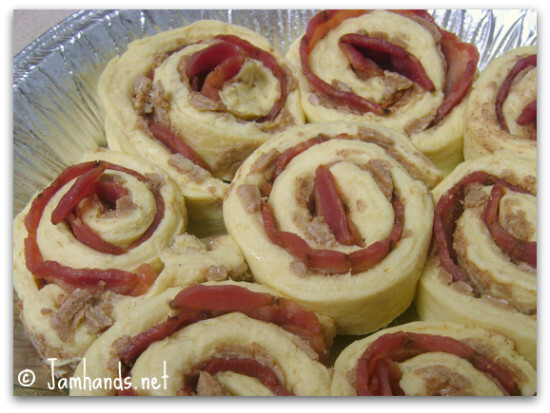 I;ve never seen bacon in cinnamon rolls , but I bet it's great! Weird! I wasn't notified of this post. But I got the Baconopolypse in my email so hopefully it's a temp glitch. Girl, these look ah-mazing. You soooo crazy! I've seen this done before, but yours look WAY better. I will have to try this some time! And I so feel like stealing the bacon birthday party idea. haha! Oh gosh I can't even imagine how good these are!! I'm having a hard time wrapping my head around this one. But you know I have to try it for myself. How could anything be bad with bacon in it? These look interesting -- good for that savory smokey sweet taste one so adores! It looks so yummy! Beautiful space you got here. Ooooh my husband will love me FOREVER if I make these for him. Well... he better love me forever either way. :) But these look amazing! oh man, i am sure this is deelish! i love bacon as desserty extra. What a great idea! Now I'm kind of mad that I didn't get bacon when I was at the grocery store earlier today:) Stopping by from TT&J. I don't know how it could get much better than this!!! I've featured you on my #20 Linky Party, feel free to grab a 'featured' button! My bacon-fiend daughter is absolutely going to flip her biscuit when she sees this!! Thank you for always having something so awesome to share on "A Little Birdie Told Me..." at Rook No. 17!